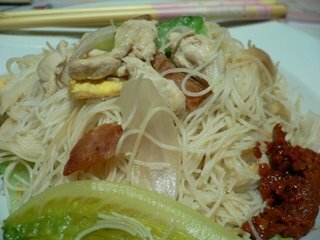 I'm satisfied with just a plate of Bee Hoon (rice vermicelli) for dinner. Kinda run out of cooking ideas these days, probably because of my back which has been aching for days. Tired of eating rice already, so I decided to fry some bee hoon instead. Having luncheon meat, lettuce, chicken & eggs in my fridge, I combined all into one dish with a tint of spicyness sambal at the side. My chicken cubes were marinated in rice wine, sesame oil & a dash of soy sauce for additional taste. Luncheon meats were shallow fried till crispy too. Everything is just perfect for today.